in a sentence: cass is buried alive by the brother of the boy who killed himself after she turned him down for a date. yes, really. cass is a high school girl who really has it together. smart, gorgeous, clever, funny, and of course, manipulative. when she turns down david kirby (mega-nerd) for a date, the next day she finds out he killed himself and can't help but feel kinda guilty about it. but that guilt materializes as she fights for her life - in more ways than one. the struggles she faces are internal and external, just as they are for kyle kirby - her kidnapper and torturer. obviously this is a grim story. it's super heavy, but well worth the read. there's some swearing action here and there, but nothing too shocking considering the characters are 17 and older. also, the family dynamics of this story are so interesting. and when i say interesting, i mean depressingly, heartbreakingly, and fascinatingly interesting. it hurts my heart to even imagine that there are family dynamics like the ones in this book, but the reality is that there are too many families like the ones Giles explores. i loved the multiple storytellers, and the multiple fonts to help the reader keep things straight. i liked the jumping back and forth in time in a way that made sense and built up the tension in the mystery. but most of all i like the coming of age element that is present and makes the read worthwhile. the different characters come to independent realizations about themselves through this nail-biter of a book and are truly changed. i appreciated the emphasis that Giles puts on the power of words, and in such an authentic way. she makes it so clear the hurt that people can inflict with their verbal actions that it honestly makes you think about the way you talk to people, treat people, or even look at people differently. i should also note that i powered through this book in a matter of hours. that is unheard of for me! it is indeed a quick read, but the tight suspense pushed me so hard that i couldn't resist even if i wanted to! plus i loved Shattering Glass, so i had good reason to suspect this one would be quite the treat. Gail Giles, i love you. fix er up: the ending is something that i'm having a hard time dealing with. not so much with cass's character, but with the way the families cope with the ending. i'm just not sure i like it, but i'm not sure that i dislike it necessarily either. 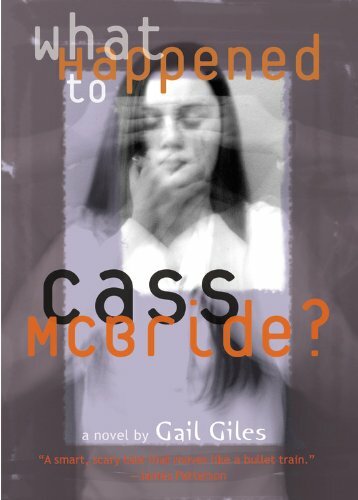 1 comment: Labels: Book Review, Edgy, Gail Giles, Mystery, Thriller, What Happened to Cass McBride? in a sentence: a widowed mouse has to move her sick child before the farmer tills up her home...lucky for her there are some super-intelligent and mysterious rats that live under the rosebush. Mrs. Frisby (whom is always referred to as such, or as Jonathon Frisby's wife) is faring pretty well with her four children since her husband's mysterious death. she sees a lot of the mouse Jonathon was in her children, especially Timothy (the youngest) - so it is especially tough when he is taken violently ill with pneumonia. her journey to make Timothy well, and to move her family safely away from the impending doom of the tractor, is her motivation throughout this story. she finds help from several sources, but most interesting and crucial is the help from the rats that she receives. 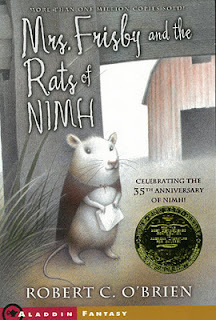 not only this, but we learn the history of these mysterious rats, what they're up to, and where they came from (hint - NIMH). i LOVED the movie as a kid, and probably averaged watching it 5-8 times a week. however, the book was refreshingly different from the movie (though i won't get into that here). the intelligence that Mrs. Frisby possesses is common sense with a deep love and devotion to her former husband and children - and is not looked down upon or scoffed at by the rats who have a "superior" intellegence. very interesting social commentary going on, but not above the level of reader that this book is intended for. her journey is a wonderful read and includes the real fruits of a journey such as sadness, frustration, success, joy, and indecision. the characters are not sensationalized (which was a very good thing), but still match what i felt an owl's personality might be like, or a crow's personality might be like. i was most impressed by the ending of the novel, and the somewhat inconclusive nature of it that left it open...but it felt like the right thing to do from the literary standpoint and from characters standpoint as well. and i'll admit it, i was in LOVE with Justin, one of the rats with a super smooth coat, intellegence, kind heart, and an obvious crush on mrs. frisby! - (after Jeremy the crow is discovered by mrs. frisby) "Birdbrain, thought Mrs. Frisby, and then recalled what her husband used to say: The size of the brain is no measure of it's capacity. And well she might recall it, for the crow's head was double the size of her own"
- (when the rats are planning their escape) "'And then what? What will happen when he announces that there's a group of civilized rats roaming loose - rats that can read, and think, and figure things out?' I said: 'Let's wait until we're free before we worry about that.' But Jenner was right. It was a thing to worry about, and maybe still is." fix er up: i had a hard time visualizing of what life under the rosebush looked like from the description...but then again i had the movie to fall back on so it wasn't all bad.